There are two stories woven together in this book: the story of how Andy’s mother fell and broke her arm when she was younger, and the story of how Andy’s cat is wounded in a fight with another cat. And in both cases, there is the story of how the injured party gets better. 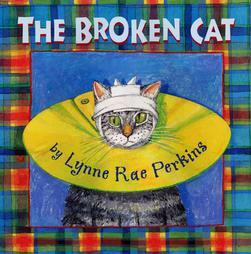 When I drew the pictures for this book, I had a lot of fun drawing the different feelings that the cat and the girl who broke her arm (Andy’s mother) were having. Do animals show their feelings the same way people do? Are their faces like ours? How do we know when our pet is calm and relaxed, happy? How do we know when they are afraid? How do we know when they don’t feel well? It might be fun to draw pictures of these different animal feelings. Here is an example of a grumpy cat. But you would be grumpy, too, if another cat bit you on the head. that is so cute (the band-aid)!